Today, one of the largest sculptures in London was installed on the plaza outside the front entrance of the Crick. A staggering 14 metres high and made of weathered steel, the sculpture entitled 'Paradigm' provides a strong, visual statement for the Crick. 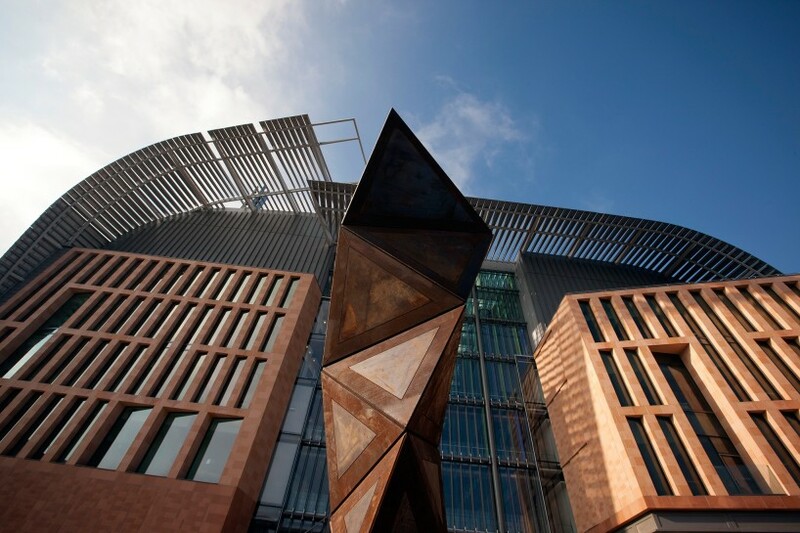 In 2014, following a long process that whittled down seven potential artists to just one, Conrad Shawcross was commissioned by the Crick to create a stunning piece of public art to be located in front of the new institute. Funded by a grant from the Wellcome Trust, the sculpture is an astounding feat of engineering and continues the artist's long standing collaboration with structural engineering practice Structure Workshop. Starting from a base of under one metre wide, which seemingly punctures the pavement, each subsequent tetrahedron grows steadily in volume to the top tetrahedron that is a monumental five-metre wide width and height. Paul Nurse said: "It is important for the Crick that researchers collaborate with colleagues from other disciplines. New advances often occur when we are able to look at things from a different perspective. Conrad's stimulating design for Paradigm draws on both artistic and scientific inspiration, and is an interesting piece of engineering. The Crick is proud to contribute to the cultural landscape of London through this impressive public sculpture, which echoes the industrial heritage of Kings Cross and encapsulates the ethos of the Crick with its boldness and ambition." Conrad, who is the youngest living artist to be elected to the Royal Academy, said: "Paradigm is inspired by science and ideas of science and is also a metaphor for potential; the potential to grow, to take risks, to be bold and brave. All qualities which are necessary for scientific progress and qualities which I think the Crick's researchers will have in abundance. I chose weathered steel as the material for the sculpture because it is true to the industrial history of the area and is designed to be robust and practical." If you want to take a look, the stunning sculpture can be viewed from Midland Road, at the east end of the new Crick building, adjacent to St Pancras International Station.